K. Scott Richey: Why is my Measured Peak & Plateau Pressures the Same? Why is my Measured Peak & Plateau Pressures the Same? Why are my measured peak & plateau pressures the same? Is this something to do with the ventilator, or the patient? Can this be right? Well actually yes, measured peak & plateau pressures can be the same especially during “no flow” states. You will see it when utilizing Pressure Control modalities (PC-CMV, PC-IMV) & Adaptive Pressure Control modes (PRVC, APV, Auto-flow. VC+), when flow is allowed to fully decelerate. Note- PIP is equal to alveolar pressure when there is no flow occurring. Plateau Pressure A pressure value that is maintained constant during a portion of the inspiratory phase of the breath (2) AKA- Alveolar pressure. After reviewing the definitions one can see that plateau pressure is a component of PIP. So how can the two be equal? PIP is equal to alveolar pressure when there is no flow occurring. So when no flow is occurring you have very little if any resistive pressure. When obtaining measurements for plateau pressures most ventilators use the “Rapid interruption method”. Thus is performed by an end-inspiratory occlusion maneuver by means of the internal valves of the ventilator. -Patient paralysis or deep sedation achieved. 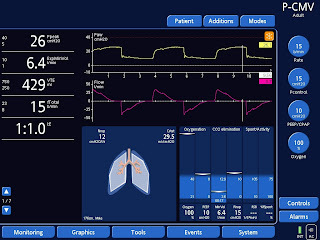 -Ventilated using VC-CMV, with a square wave inspiratory flow. -End-inspiratory pause of 10-20% of cycle duration (~ 4 second hold). The following screen shots is a real time recording of pressure & flow during a ~ four second occlusion maneuver. In the example the patient was being ventilated using a adaptive pressure control mode (VC+) with a PB840 ventilator. Area shown in the Yellow square demonstrates end-inspiratory occlusion. Yellow arrow points to the start of the maneuver. Arrows show that flow does not fully decelerate to base line before the start of of the occlusion, (this is not a "No flow state) so there will be differences in measured PIP & plateau pressures. Arrows show the differences in the PIP & plateau pressures. The below image shows Flow fully decelerating, thus creating a no flow state. So when performing a occlusion maneuver the PIP & plateau should be equal. The below video demonstrates increasing inspiratory time to allow for flow to fully decelerate. Hamilton G5 Ventilator Screen Shot, showing Peak & measured (arrows pointing to the hold, & value in yellow box) plateau pressures equal, when flow is allowed to fully decelerate. 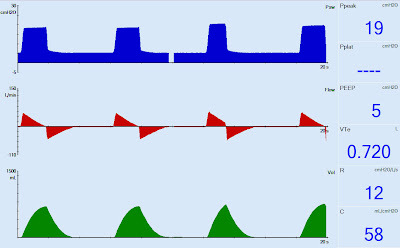 The Rapid interruption method does provide data on passive respiratory mechanics, however is not ideal for clinical use due to the various recommendations for precise measurement (e.g patient paralysis/deep sedation, VC-CMV mode). Due to these restrictions a few ventilator manufactures utilize different sampling techniques for obtaining respiratory mechanic measurements. One technique is "Least Square Fitting" this is a mathematical approach based on the equation of motion. With this technique there is no need for occlusion maneuvers, or specific flow patterns, it can be applied in any mode of ventilation. This is available on Hamilton ventilators. 3. 3/4 of the previous expiratory time. This is available on Draeger Evita series ventilators. What the heck is P0.1?